This guy looks so angry. It's probably the terrible UI. Magic 2015 is not a bad game, but playing it is. This week on PopMatters, I spend some time pondering why a game that should be so satisfying, and sometimes really is, can also be an absolute frustrating train wreck. The answer, I believe, is that Stainless Games has built an experience almost entirely directed towards a tablet-playing audience comfortable with micro-transactions. Make no mistake, that audience is there. Hell, if I had a tablet, I would probably be loving this game. Unfortunately there is also a large PC and console player base that feel overlooked or even maliciously neglected. 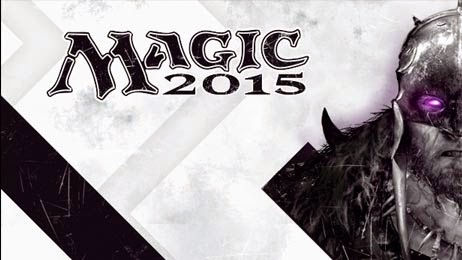 Magic 2015 is the best example of how mobile gaming norms can fundamental change the shape of a product. With significant trimmings and UI changes between this year's and last year's installment of the Duels of the Planeswalkers franchise, the latest game feels like the end game for a company eager to grab hold of a new market of players. Unfortunately the step towards the mobile player base, those potentially new to Magic the Gathering entirely, is also a step away from an aging group of players who want to casually, but with ease and freedom. I honestly don't know if the developers can please everyone, and to some extent fools like me might just buy these games anyway. But I have a suspicion that the move is an act of desperation that may ultimately alienate the most influential group of Magic followers Wizards of the Coast still has around.